Can You Cash Structured Settlements Without Paying Taxes? Can You Cash Structured Settlements Tax Free? When you cash structured settlements for a lump sum, it is important to consider the tax implications. Generally, if you reached a structured settlement agreement as a personal injury insurance claimant, such as compensation for being injured in an auto accident, your claim won't count as income for tax purposes and it won't be taxed. NOTE: this article about taxes when you cash structured settlements is for information only. It may be partial and we don't make any claims of its accuracy. Consult a tax expert for any advice needed. In other cases, such as punitive damage, or claiming for emotional distress, your claim will be counted as income and so will be taxed. Likewise, claiming for lost wages will be taxed since it is to replace income that you lost and so it counts as income as well. For taxation purposes, it really doesn't make a difference whether you are getting your award as a result of a judgement or a settlement. It also doesn't matter whether you receive your claim in a one-time lump sum or in structured settlement periodic payments. 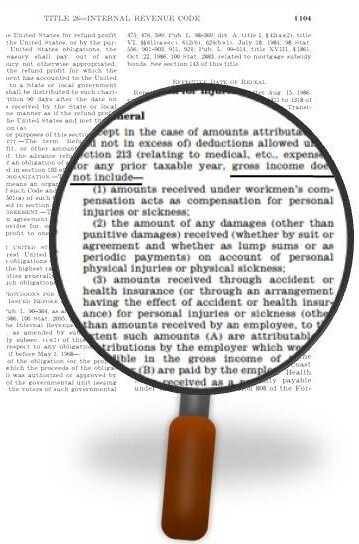 If it's excluded from Section 104 of the IRC, such as in the cases mentioned above, it will not count as income and not be taxed. Talking about structured settlement payments specifically, it is easy to differentiate between what is known as qualified vs. non-qualified structured settlement assignments. Simply put, a Qualified assignment isn't taxed, while a non-qualified will have a tax obligation. What constitutes a Qualified or Non-Qualified structured settlement assignment? Structured settlement payments for personal physical injury and damage as a result of an auto injury will be considered a Qualified Assignment. Similarly, workers' compensation structured settlements for personal injury at work are Qualified Assignments. As such, structured settlement payments in these cases will not be taxed. Neither will the interest gains on the personal injury structured settlement payments be taxed as part of government policy to encourage structured settlement agreements for plaintiffs in order to secure long term support for medical and financial needs. On the other hand, payments from Non-Qualified structured settlements will cont as income and be taxed. What If You Cash Structured Settlements? Now to our discussion of interest: will you pay taxes on a lump sum that you receive when you cash structured settlements? If your original structured settlement was a Qualified Assignment, you will not pay taxes on cash earned from selling structured settlement payments, since the original structured settlement payments were not taxed. This is of much importance for those who cash structured settlements payments for a lump sum since cashing the payments will already incur a substantial loss to the seller as the payment rights are sold a significant discount considering the present value of the future payments as well as the effective discount rate applied by the structured settlement buyer. Thus, if you would have to pay taxes for cashing in your structured settlement, your loss would have been even higher. Luckily, as explained, Qualified structured settlement assignments at least will not have a tax obligation. However, if you cash structured settlements that are Non-Qualified, then you'll pay taxes on the cash earned from the sale of the payment rights, since you would have paid taxes on the original structured settlement as well. Cash from selling lottery payments will also have to be taxed. Read more about lottery win taxes here. The above was relevant to paying or not paying taxes when you cash structured settlements, but what if you reinvest the structured settlement cash and earn interest on it? 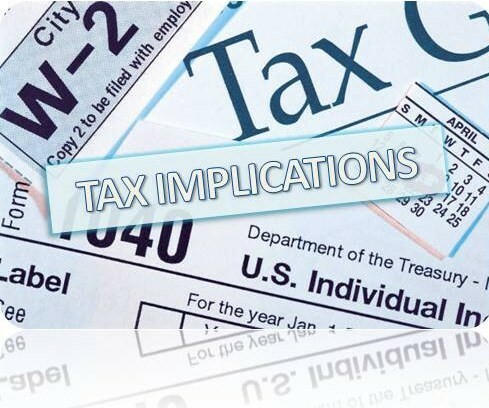 Would it still be qualified for tax exemption in applicable cases, or the capital gains on the structured settlement investment will count as income? The answer is that while you do not pay taxes on money that you get when you cash structured settlement payments for a lump sum, there will be a tax obligation on any interest gains of reinvested money from structured settlement cash outs. This is another reason you should carefully consider a decision to cash structured settlements annuities. Not only will you get much less for selling the payments than you would from future payments, but if your purpose with selling them is to reinvest the money, you should mindfully factor in the taxation element and compare the total value of the non-taxed future structured settlement payments to the total value of the sale considering taxes on capital gains of the investment. This way you'll be able to come up with a more realistic assessment of the long term costs and benefits of selling your structured settlement. In case of annuities you should be extra careful if you cash annuities for the purpose of purchasing a new policy. As said, income from cashing annuities is taxable. This may still be a better option than surrendering annuities, where you may get a smaller sum and pay surrender charges as well as a 10% tax penalty for early withdrawal. However, careful thinking and comparison should be done to ensure that the transaction is worthwhile. Your new annuity plan may include more benefits, but also limitations and added charges that may offset the advantages and result in less earnings than the original annuity payments. Add to this the tax charges for selling the annuity and your ROI will reduce even more. However, in some cases you can take advantage of the IRS 1030 exchange code that will keep your annuity transfer tax free provided that you transfer over the old policy into a new once. In this case, an exchange may be preferred over selling your annuity and then reinvest the cash into a new one, a move that will render your cash withdrawal taxable. Also, while exchanges between annuity policies may benefit from the 1030 code, like exchanges from life insurance policies or annuities to another life insurance policy - an exchange from a life insurance policy to an annuity may not take advantage of the 1030 exchange code to rid itself from tax liabilities. Want To Cash Structured Settlements? That's What I'm Here For! CALL NOW and You'll Get An Excellent Deal. After Thousands of Customers and MILLIONS In Transactions - You Know I Can Be Trusted! Is it time to sell a structured settlement?